Like the rest of the world it seems, I often watch how much wheat I eat. That means I don’t often eat bread, which is too bad because when it’s hot and fresh, it’s a favorite thing. But our trip back east last month, part of which was visiting Matt’s family, got me rethinking that a little. Specifically Aunt Emily’s bread. Emily’s bread was homemade, the kind of bread that’s been made a thousand times and that there’s no recipe for. It’s simply passed down from her mother and absorbed through some sort of familial osmosis. Sitting at her kitchen table, enjoying our lovely conversation, sharing that delicious bread–it represented everything special about home and family–nourishing, comforting, healthful, and full of care. 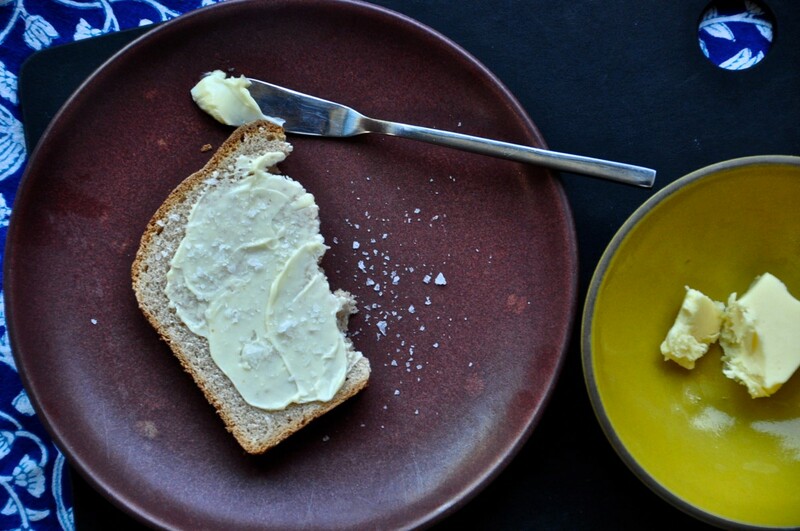 It amazes me that something so simple as bread can do that. Once I got home, I set out to find a recipe that could possibly mimic Emily’s, one that I could work and rework over time to try and get that perfect balance of tenderness, heartiness and depth. It’s ain’t easy. I decided to use an equal mix of sprouted wheat flour (which makes the wheat more digestible and less prone to irritate) and bread flour. 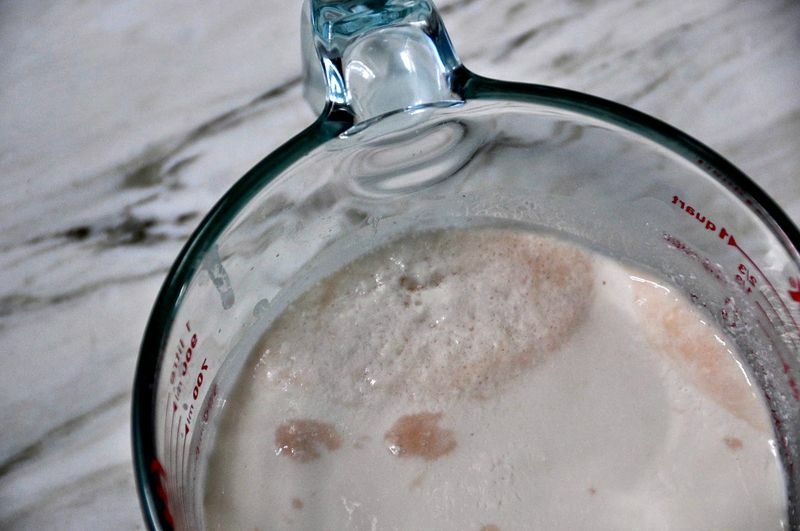 Next, I heated buttermilk and water to 110-degrees and added it to the yeast and sugar. 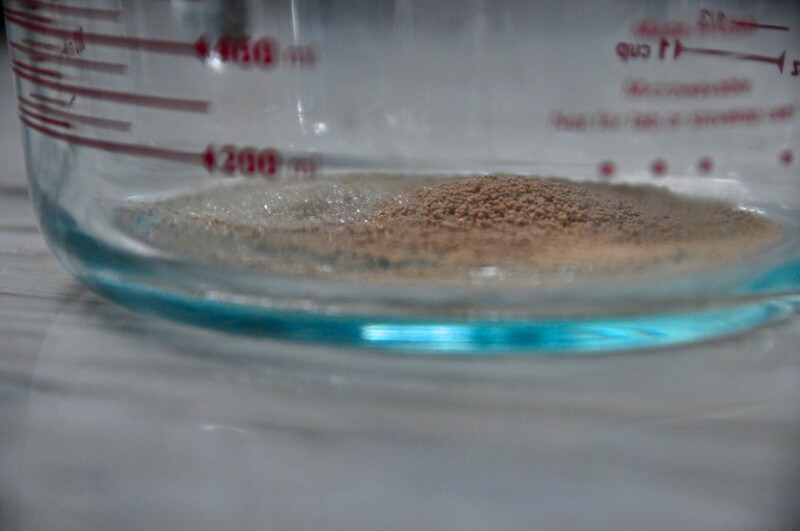 Then it sat for a few minutes until it looked like the yeast was activated (above). It’s not the prettiest thing. 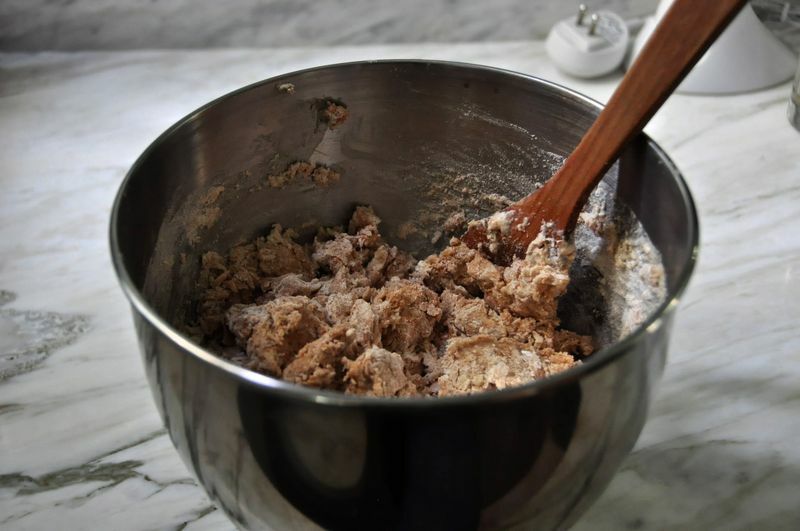 After adding the milk/yeast mixture to the flours, it all gets mixed together with a wooden spoon and then onto the stand mixer fitted with a dough hook for a 10-15-minute kneading session. Of course this could also be done by hand. 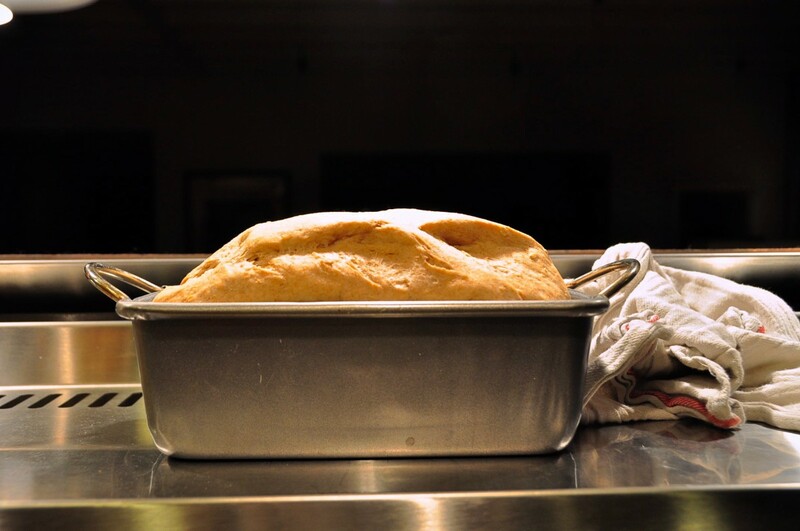 Once the kneading is done, the dough should be pliable but have structure, it shouldn’t be too hard or too soft. Bread is a tricky thing. You can have a recipe, follow it to the letter, and it still may not come out just right. It’s a food that requires patience and persistence, and offers an opportunity to make it your own. I wouldn’t dare say that my bread comes anything close to Emily’s. 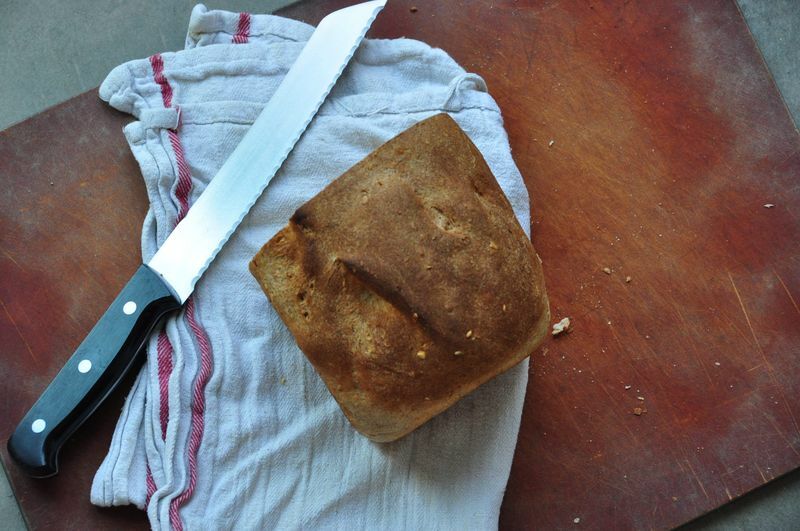 But for a novice, and if you’ve never baked bread before, this is a good place to start. My kids love it, especially toasted. And it makes me feel better about indulging especially if it’s made from scratch and with care. It makes me look forward to the day when baking it will become second nature, something not to fret or fuss about, but just do. Maybe someday I will be sitting around my own kitchen table eating it and will inspire someone to make that extra effort to share something special. Thank you Emily. In a small saucepan, gently heat the water and buttermilk to 110 degees F (43 degrees C). Place the yeast and 1/4 teaspoon of the sugar in a small bowl; pour the heated buttermilk mixture into the bowl and let proof for 5 minutes. 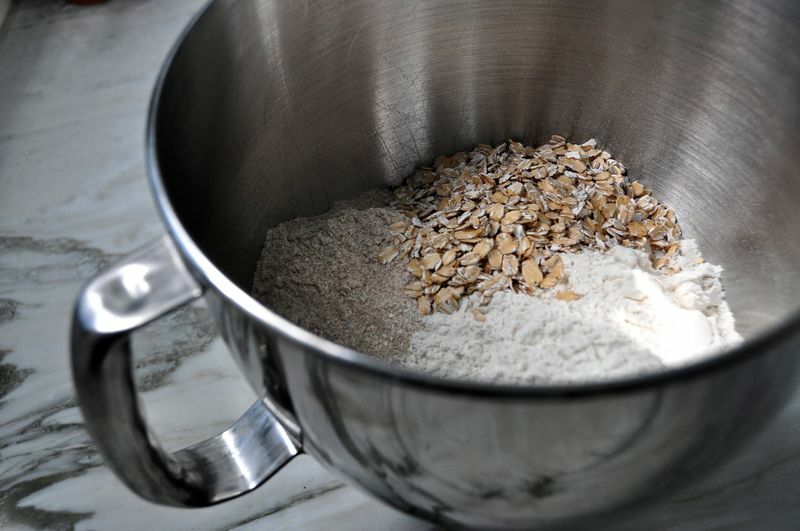 In a large bowl, combine the flours, oats, remaining sugar and salt. 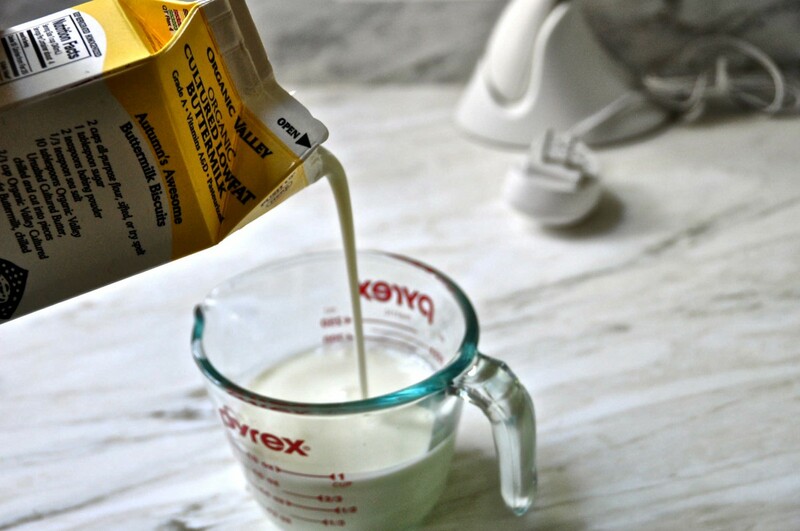 Add the yeast mixture, remaining buttermilk mixture and butter and mix with a wooden spoon to combine. 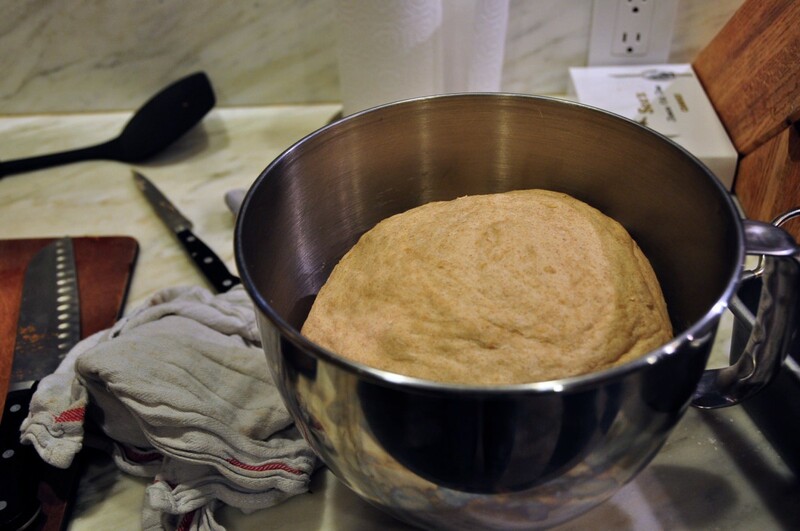 Turn dough out onto a floured surface and knead until smooth and elastic, about 10-15 minutes. Add flour as necessary. Return to mixing bowl and let rise until doubled, about 1-2 hours, depending on how warm your house is. 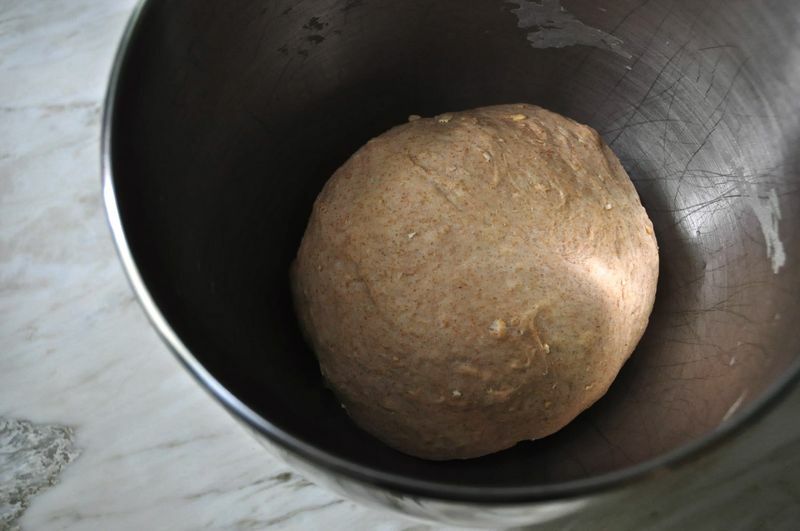 Form risen dough into loaves, buns or whatever shape you wish. Place in greased pans (if making a loaf use a 9×5-inch pan) and let rise until nearly doubled, about 1-2 more hours. During the last 15 minutes of rising, preheat your oven to 375-degrees. 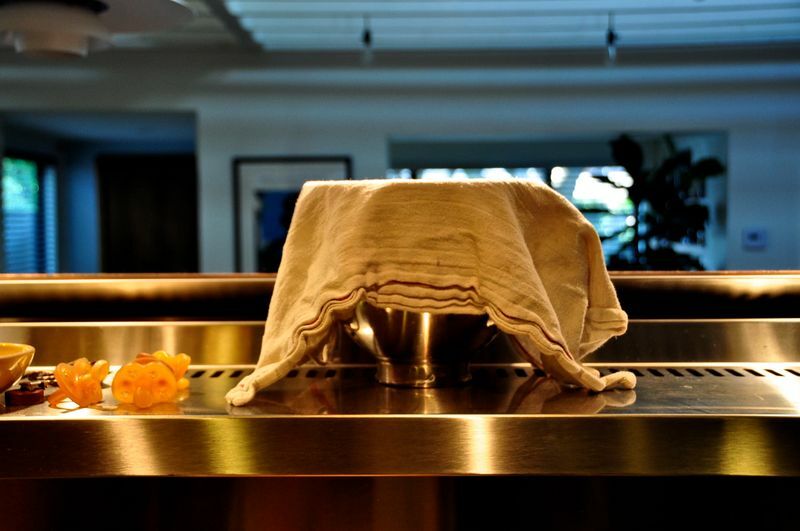 Bake risen bread until nicely browned and load sounds hollow when rapped on the bottom, about 20 minutes. Remove from pan and allow to cool completely on a wire rack before slicing.